› Author AffiliationsThis work was supported in part by a LabEx CSC ‘Chemistry of Complex Systems’ grant and from the European Research Council (ERC) under the European Union’s Horizon 2020 research and innovation programme (grant agreement no 639170). 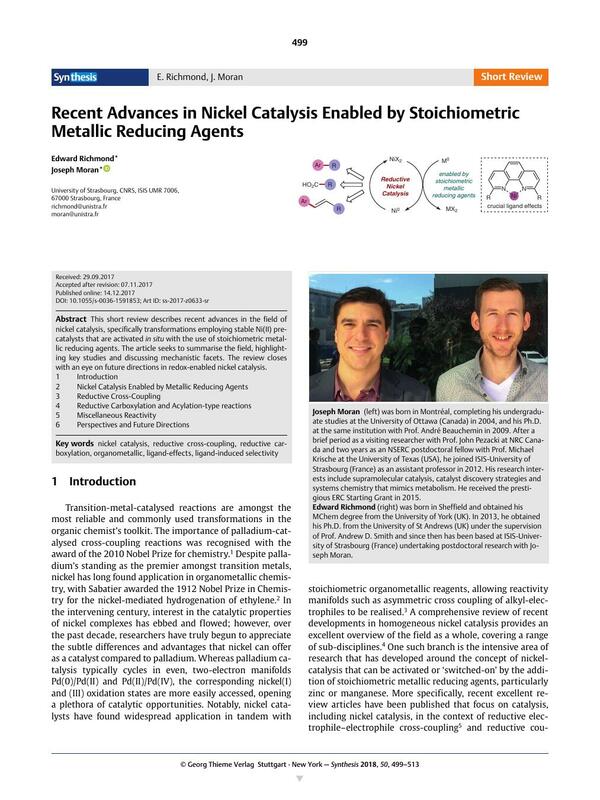 This short review describes recent advances in the field of nickel catalysis, specifically transformations employing stable Ni(II) precatalysts that are activated in situ with the use of stoichiometric metallic reducing agents. The article seeks to summarise the field, highlighting key studies and discussing mechanistic facets. The review closes with an eye on future directions in redox-enabled nickel catalysis.